Page 1: The paper is no longer called the London Evening Standard, simply the Evening Standard, because the editor wants it to have a greater resonance outside London. Neither of the two stories on the front page are London-based. The word London still appears in small letters, top left, after the word Free. 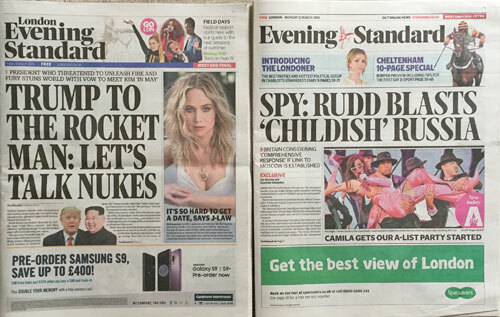 Page 1: Eros has returned to prominence on the masthead, inbetween the words Evening and Standard. Originally Eros only appeared to indicate the final edition of the day, but these days the paper always goes to print before lunchtime. The first edition of the day is labelled 'West End Final'. Any subsequent pre-lunch changes merit a 'West End Final Extra'. Page 1: The font's changed. You can see this most clearly by comparing the two mastheads. The new font is called Standard, and is a bit narrower. Page 1: The front page now has more room for splashes, and less room for news. Page 1: The lead story has been spun from an interview with the Home Secretary (on pages 24 and 25). It remains a mystery how the editor of the Evening Standard managed to obtain an exclusive interview with one of his former Cabinet colleagues. Page 1: I have a theory that, more often than not, the Evening Standard tries to include a large photo of an attractive woman on its front page. Today's paper does not disprove my theory. Page 2: The first column lists highlights to be found within, and introduces the new colour-coded sections. Page 2: The weather forecast now features an emoji to sum up the day's weather. This Thursday and Friday are summarised by a turd emoji (which today's weather probably deserved). Inventive, or crass? Page 2: The first news story is about austerity and Brexit - two of the former Chancellor's pet topics. Page 3: A long story about a good Ofsted report, a short story about good news in Walthamstow, and a short report on a knifing in Wandsworth (which focuses on the victim's aunt, Liz Hurley). Page 4: Spy scandals, nerve agents and acid attacks. Page 5: A big story about a family feud over a £2m property - prime Standard fodder. Page 6: Two stories about tube violence, and one about Justin Bieber wearing lime green trousers. Page 7: A Chelsea-based fashion label has gone bust. "The news follows the closure of vegan blogger Ella Mills' Deliciously Ella cafe in Herne Hill and deli in Marylebone after less than a year." Pages 8/9: Results of an exclusive poll on Brexit, which basically shows the public agrees with George Osborne. Page 11: Obituary for Sir Ken Dodd, including nine of his best jokes lifted from a list the Daily Telegraph published at 5am. Pages 12/13: In-depth report into violent youth crime. Also, moped robberies. Page 14: Wealthy socialite dies in plane crash on way home from Dubai hen party (4 paragraphs). 40 die in Nepal air crash (1 paragraph). Page 15: Comment: Trump is funny. Emma Watson finds love. Mothers Day controversy. I saw a nice musical. Page 16: Editorial: The Home Secretary is fab. Our relaunch is exciting. We miss Doddy. Also, pro-Remain article from cross-party MP twosome. Page 17: Comment: Conservative Culture Secretary praises newspaper run by former Conservative Chancellor. Cartoon ridiculing the current Conservative Chancellor. Page 17: Notebook: Dinner parties can be hell. What I call my basement flat. I use my mobile in the bathroom. I read some research about upper/lower lip ratios. Page 18: The Reader: Revamped letters section, which includes one fewer letter than Friday's newspaper. Only two of the letters are from 'ordinary readers'. George Osborne replies to the letter from the important businesswoman. Page 19: Interview with director of new West End musical. Four star review of aforementioned musical. Pages 20/21: The Londoner (formerly Londoner's Diary): Oprah has tea at Claridges. Roads Minister in driverless prang. Jacob Rees-Mogg is moving house. Windsor version of Monopoly may be played by Queen. Chief Whip keeps spider on desk. Two female designers spotted in India. Mayor discusses avocados. Tory slogan to be glued to wall at next conference. Pages 22/23: International news from the US, South Africa, Sydney, Afghanistan, Austria, Greece, Ireland and India. Pages 24/25: Positive interview with Home Secretary Amber Rudd. Advert for London Live. Pages 26/27: The A-List: Donatella Versace loves Annabel's. Several well-dressed music stars attended an awards ceremony in California. James Corden has a film to plug. Steven Spielberg has a film to plug. Pages 29-32: Life & Style The usual Monday lifestyle section. This week's features online dating, energising workouts, Aperol slushies, fine dining deals, handbags, detox packages, exercise tips and "selfie-ready" foundations. Page 32: London Love Stories: The twenty-something owner of a vegan search portal and her macro-strategist partner from Battersea reveal all about their relationship and upcoming marriage. I look forward to seeing a wide range of ages, social classes and ethnic backgrounds as this feature unfolds in future weeks. Pages 33-35: Arts & Culture (sponsored by a home insurance company): Several Brits are playing on Broadway. British Museum exhibition is OK. Two concert reviews. Also "10 must-see shows for the week ahead". To attend all ten would cost £280, and occupy at least six of your evenings. Two are sold out. Pages 36/37: Tonight's television: In a shock move, London Live's listing has been demoted from the first column to the last. The lead TV preview is for a show on BBC1. Three are for shows on London Live. One is for a chat show on Sky Atlantic, in a 'Pick of the Day' section sponsored by Sky. Pages 38/39: Puzzles & Games: Now across two pages rather than one, along with a Kipper Williams cartoon and the latest air/river pollution reports. New puzzles include Battleships and "The Tube Quiz", a somewhat restrictive format based on cryptic clues to names of Underground interchanges. Pages 41-43: Travel: The Standard's reviewers enjoy Venice, Johannesburg, Tanzania, "hipster hubs in Africa", Bali, Madrid and Luton. Pages 49-54: Business (now on salmon-tinted pages): Over 20 stories about shares, markets, companies, deals, property and entrepreneurs. The Standard always has far more stories about the City than about Outer London. Pages 55-65: Sport: Eleven pages of Cheltenham racing preview, sponsored by Paddypower. Also includes adverts for Betfair, Coral, Sky Bet and Ladbrokes. Page 66: Sport: Three opinions on why England are currently rubbish at rugby. Page 67: Sport: An Arsenal player talks, a tennis player fails, a cricket player is on trial. Pages 68-70: Sport: West Ham stadium unrest - one in-depth report, and two opinion pieces. Page 71: Sport: Injured Spurs player awaits scan. Quick crossword. Sudoku. Page 72: Full page advert for Betfair, because adverts pay better than sports news.